History will never forget 27th December, 2007, a blood stained day. The day Mohtarma Shaheed Benazir Bhutto was assassinated alongside her party workers after addressing a large public crowd in Liaqat Bagh Rawalpindi. Shaheed Benazir Bhutto did not fear death. She chose death among her people rather than staying away from her homeland. She was cognizant of the dangers to her life but she refused to bow before the dictator and the terrorists. She challenged the dictator and came out on the streets of Pakistan to lead the public toward democracy and justice. She strengthened democracy with her life-long and finally by the sacrifice of her own life. Like her father before her she gave her life for Pakistan and democracy. Throughout her life Shaheed Mohtarma Benazir Bhutto struggled against regressive forces to make Pakistan a better place for the members of every sect, religion, linguistic group and community. She was loved by people of every creed and race, and language and color. From Parachinar to Karachi she was the only voice of the oppressed people of Pakistan. She was and is still the symbol of the Federation of Pakistan. Benazir Bhutto Shaheed began her political career during the brutal dictatorship of Zia-ul-Haq . He embedded terrorism, extremism and an alien form of social norms and was the father of the armed militias Pakistanis are being murdered by even today. Benazir Bhutto Shaheed and her mother Begum Nusrat Bhutto heroically fought Pakistan’s most tyrannical dictator Zia-ul-Haq. In her book “Daughter of the East” Shaheed Benazir Bhutto, the daughter of Pakistan’s first democratically elected Prime Minister of Pakistan is a testimony of her relentless struggle for justice and her personal courage and valour. For six months Shaheed Benazir Bhutto was kept imprisoned in Sukkur jail under harsh conditions. 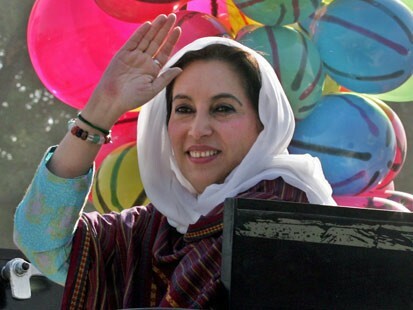 After being released from Sukkur Jail she was hospitalized for months as her health had suffered greatly as a result. Later she was shifted to Karachi central jail where she remained in prison till 11 December 1981. Shaheed Benazir Bhutto’s pains did not end here. She was placed under house arrest in Larkana for eleven months and then in Karachi for fourteen months. Pain, distress and difficulties were hurled on the Bhutto family which was bravely borne by both, mother and daughter. Those who were once close allies abandoned them. But the workers of the PPP, the true soul of the party went to jail, were tortured, their families were harassed but they kept the faith. Shaheed Benazir went on to become the first democratically elected Prime Minister of the Muslim world and was elected again – after a Prime Ministerial stint by Mr Nawaz Sharif where once again Shaheed Benazir and her family and workers were hounded by false cases, propaganda and jail terms. On her return to Pakistan after a long exile on October 18, 2007 two blasts hit her welcoming rally and 275 party workers lost their lives while over 600 were injured. Even this tragic episode of Karsaz did not deter her and she continued with her political struggle for Pakistan and its people. At the end Benazir Bhutto gave her life on December 27th 2007 while fighting the dictator and extremist forces among her people. Today, democracy exists in this country and the original Constitution has been restored because of the relentless sacrifices of the Bhutto family. Shaheed Mohtarma always dreamed of a Pakistan, free from poverty, terrorism, illiteracy, unemployment, corruption, inflation and sectarian violence. She persevered and struggled to make Pakistan a a peaceful, progressive and tolerant educated society. Today, orphans are given shelters with better education in “Sweet Homes of Pakistan” under the legacy of Shaheed Benazir Bhutto and poor women are supported economically through Benazir Income Support Program. Provinces have been empowered under the 18th amendment and parliamentary supremacy has returned. Gilgit and Baltistan have been granted their due rights and the FCR has been passed. Attempts to empower Balochistan have begun through Aghaz-e-Haqooq-e-Balochistan package. These objectives of Benazir Bhutto Shaheed have been fulfilled by the PPP under the leadership of President Asif Ali Zardari. President Zardari and Prime Minister Gillani have also pursued her policy of reconciliation which has brought almost all political parties under the same roof for the betterment of thePakistani people, supremacy of constitution and strengthening of democracy. The true greatness of Benazir Bhutto lay in her gift of love for her children, her parents, her friends, her party and its workers and for Pakistan. I will always be grateful for the time I had with her. She remains my inspiration. Shaheed Benazir Bhutto shall be remembered forever in history for her bravery, persistence and sacrifices. No two views on the struggle of BB and her sacrifice. However, it is ironic that five year rule by her husband AAZ, her killers were neither appprehended nor shared with the people. Your struggle for highlighting the ethnic cleansing of Ahmedyyia commmunity and others is apprecisted, however, the Ahmedis werevdeclared as non muslims by ZAB, the more enlightened leader that we had but you refrain from mentioning his name while criticise Gen Zia for all our problems. Also, please be fare in your articles to your country Pakistan where there is a good degree of religious tolerance and freedom of expression and a free and a vibrant media. Please also state the facts sbout the Mardan student who was killed by the most liberal political party ANP and its students wing and not by religious zealots.